Quick, someone convince Trump that he can hold a special, nation-wide election tomorrow. May just collossaly f*cked up, bigtime. (Sadly, we have a new infestation of Tory MP's in scotland but I suspect that's more of a protest by brexiteers and those that were scared of indyref2 than any serious shift in ideals, and SNP are still in charge, so not as bad as it could have been...I'm thinking the upcoming inevitably disastrous brexit negotiations will temper their victory north of the border somewhat). Yeah, the more immediate and immediately obvious the fallout from brexit becomes the less support the tories will find in Scotland. But I wouldn't have predicted folk would flip flop from SNP to Tory so what do I know? Eh, well sadly Ruth Davidson is actually a very good politician, annoyingly so in fact and she's done a lot to shed the "oxford bred boys-own austerity club" image from the party north of the border over the last couple of years. Combine that with them stoking the fears of indyref2 and it's not surprising there's been some pushback. Taken in perspective though...this really just pushes the SNP from a pretty strong majority to a regular old fashioned majority. If it means they maybe need to refocus on tackling some of the more immediate problems (education, poverty, etc) instead of focusing entirely on indyref2 for a couple of years...probably would't hurt, and I say that as someone who would be quite happy with independence thank you very much. Dugdale was legitimately telling people In certain areas to vote TORY to deliberately weaken the snp, which tells you all you need to know about Scottish labour. Eh, well sadly Ruth Davidson is actually a very good politician, annoyingly so in fact and she's done a lot to shed the "oxford bred boys-own austerity club" image from the party north of the border over the last couple of years. I wouldn't rule out Ruth Davidson being the Tory party leader in the future. She is very charismatic, personably likable and competent. Being gay is the icing on the cake. I can't help but feel a little sorry for Alex Salmond. Always had a soft spot for him. Macron's bid to create a party from whole cloth starts tomorrow and it looks like what many thought was impossible. Recent polls suggest LREM may attract 30% of the vote, well ahead of the centre-right Republicans and far-right National Front (FN). Significantly, that would give him at least 330 of the National Assembly's 577 and possibly far more. 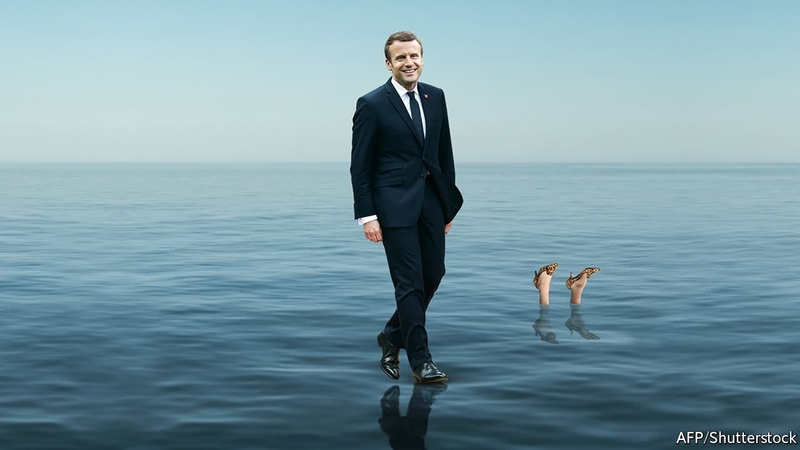 I genuinely feel that if he pulls this off it could be the beginning of a new era for France and Europe. So, no pressure then. I'll be casting my vote accordingly. Here's to hope. In dire need of it lately, myself. Right now something good and positive in the world of politics would be a welcome change. Fingers crossed. I... I'm so confused. You guys are having a THIRD election now? Are you the opposite of the UK, where you elect the PM first, and then have a second election for parliament? Macron was elected President. That was the one election over two weekends. This is for the Parliament which is also held over two weekends. The Parliament the elect the Prime Minister but that office holds less power than the President. However the PM can make life very difficult for the President. I hope not. While my understanding is that in some cases an election like your last one would lead to a quick new election, I feel like the UK really can't afford to take the time to hold another election while your Brexit clock is ticking. On the other hand a weakened or divided government might cost even more time. Another election could really just give the same result again though, it seems a bit pointless. The brexit clock is ticking but I would place serious money that we will see a Tory leadership challenge and a following general election within the coming 12 months. Ah, yes. He or she only has to command the confidence of the Assembly (shouldn't call it a Parliament either). I stand corrected. Thanks. I understand the justification of the two Presidential votes, runoff election and all that. What is the reasoning for splitting the Parliament vote from the Presidential vote? Is the idea that the knowledge of who the President will be may change Parliament votes? Well, Yes. The French held a referendum in 2000 to shorten the President term to 5 years and hold Assembly elections a month after the Presidents. The point of it was to avoid cohabitation, where the President and Prime Minister are in separate parties. Edit: And Marcon is set to have a thumping majority. Sorry about the all too short post regarding the PM yesterday, I was on my phone with my eldest, and well, that's what happens. There is a downside, though, roughly half of the country cast a vote. That's a disappointing turn out, but most analysts are saying that this is mostly a result of disappointment in the more "traditional" parties. If all goes as planned next Sunday, There should be about 400 of the 577 seats at the Assemblée Nationale either for La République En Marche (Macron's new party) or the MoDem (Mouvement démocrate) (Bayrou's traditionally centrist party which has allied itself with LREM). That's unprecedented, and would mean that Macron would have absolute majority at the Assemblée Nationale. A few extra info: Marine Le Pen's party scored 13% on a national level and she herself gathered a massive 46% of votes in her district. Disappointing, really, I wish the far right wouldn't score so high. Mélenchon's party and the communist party combined scored about the same 13,7% and the man himself is in the lead in his district in Marseille with 34% of the votes. Huge defeat for the left, the Party Socialist doesn't even cross the 10% threshold on a national level and quite a few former socialistes didn't even make it to the second round (Jean-Christophe Cambadélis, head of the PS, Fekl, Boistard, Filippetti, Lamy, Arif, Eckert and former presidential candidate Benoît Hamon). That's gotta smart. In my own district, turn out was a bit better with 59,63% and the LREM candidate is in the lead with 42,04% of votes, and the PS is in second place with only 15,24% of votes. Not much suspense there, but that won't keep me from returning to cast my vote next Sunday. This was Eleima, Goodjer correspondant in Paris. The résultats for today's election are starting to come in. The first piece of news that is a bit worrisome is the turn out, with as many as 58% of French abstaining. Macron is nevertheless confirming the victory we had predicted last week, with an absolute majority in the Parliament. It's only 8pm so some results need to be confirmed, but apparently, there would be as many as 360 seats for Macron's La République en Marche and the allied party MoDem. LREM failed to defeat Marine Le Pen in her home town of Henin Beaumont as she scored 67%. More as results come in. This is Eleima, live from Paris. Poor socialists though. Even if they might only have themselves to blame. Hopefully Macron succeeds, otherwise it could just be paving the road for Le Pen next time. It's risky, giving a bunch of mostly political neophytes high offices, but I remain optimistic. Nailed it. That's the biggest fear I and some likeminded friends have. We'll be keeping our fingers crossed. While some Assembly members are neophytes, Marcon's cabinet is far from it. That list doesn't François Bayrou who has proven himself as a very competent mayor and something of an inspiration for Macron's policies. And it's worth pointing out that many are former Republican and Socialist Assembly members. All Macron has to do is marshall the Assembly and seeing that the vast majority of it owe him their political careers that does seems beyond his competence. He also need to get past some of the more extreme trade unions I guess. Without assembly members starting to give in. News reporters here said yesterday that only 8% of french workers were in unions. That really surprise me considering how strong they act whenever any changes are proposed.